The Aboriginal Head Start On Reserve (AHSOR) Program provides early childhood/preschool intervention that supports the development of the physical, intellectual, social, spiritual and emotional well-being of First Nations children. The Program is designed for children from birth to 6 years of age, and their families living in the community of Sagkeeng. Children in the Sagkeeng Health Centre's AHSOR Program gain opportunities to develop self-confidence, a greater desire for learning, and an excellent start in their journey towards becoming successful people. AHSOR programming encourages parents, families and community members to play an important role in running the Program. The Program also builds relationships with other community programs and services so that children get the best care. The Sagkeeng Health Centre's AHSOR program is currently located at the Sagkeeng Junior High Community School. 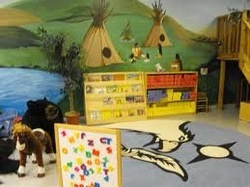 The Program runs from Monday to Thursday from September to June following the holiday schedule of Sagkeeng's schools.